Gnarls Barkley and Janelle Monae brought down a packed Variety Playhouse Monday night performing their unique brand of alternative soul, pop and R&B with an intensity and fervor that hit all the right notes. Monea kicked off the evening with a spirited, high-velocity performance that included several tracks from her new EP "Metropolis" plus the older track "Letting Go." The Atlanta singer was on fire putting her heart, soul and a whole lot of theatrics into the show. She was kicking around, dancing, prancing, flirting, flaunting, crawling, posing, twirling and head banging throughout the show. After warming up the crowd with the up-tempo stompers "Many Moons" and "Violet Stars," she toned it down for a brief moment with the beautiful acoustic ballad "Smile." She then kicked back into gear with the powerful and personal "Sincerely, Jane." The petite singer got the crowd into a frenzy (and making her handlers very nervous) when she jumped into the audience to dance with her fans. Wow. After crawling back on stage, she didn't hesitate and dived right back into the crowd sticking out her tongue and moving over hands like a little snake. This hot, little firecracker who was inspired by Tupac and Judy Garland obviously also has a huge rock 'n roll spirit. Amazing. Gnarls Barkley followed the Monea whirlwind. 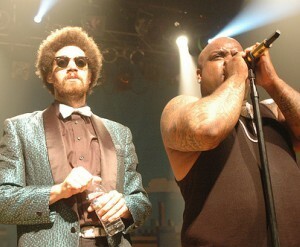 Cee-lo and Danger Mouse were in fine, fine shape. They played all of old and new hits, including "Run," "Gone Daddy Gone," "Going On" and of course "Crazy." The duo was supported by a fully-featured band including two percussionists. Cee-lo is quite a remarkable live performer who belts out a soulful tune so effortlessly, so flawlessly. From his early beginning as an Atlanta MC, he has grown into a full-blown rock star. Oddly, Danger Mouse spend most of the show sitting with his side and back to the audience playing the keys only whispering to Cee-lo in between songs. The gifted music is man is a bit of a mystery. If you want to get a feel of Gnarls Barkley's live show make sure to download their iTunes session that they recorded at the Apple Store in SoHo last month. 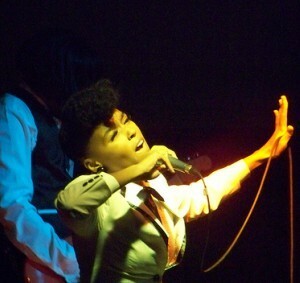 Seeing Janelle Monáe perform is like watching a firecracker ignite on stage. All that energy and all that star power packed into one stylish package is truly dynamite. This little seismic powerhouse brought down the house on Friday night when she performed at the Emory University campus as part of the Darfur Now College Tour together with artists like Novel, Anthony David and the one and only Spree Wilson. The tour aims to raise awareness about the genocide in Darfur while simultaneously promoting a new documentary, titled Darfur Now, which will be available on DVD May 27. Attended by only a few dozen people, Monáe played a short set that featured songs from her forthcoming big label debut "Metropolis Suite 1: The Chase" including the single “Violet Stars Happy Hunting" and the intensely personal “Sincerely Jane,” a song she also performed with the Atlanta Ballet two weekends back. Monáe is also emerging as a budding style icon performing dressed in her signature look consisting of waist-high, straight legged pants, miniature bow tie and black and white saddle shoes. Very vintage. 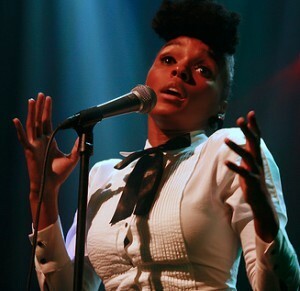 Look out for the release of Janelle Monáe's debut album on June 24. Ferras wasn't feeling all that fresh, but he belted out a solid tune at Smiths Old Bar in Midtown last night. "I was thinking about canceling my show, because I am really sick," he told a rowdy audience. "But I hate people that cancel shows, so here I am. Feel free to throw your tomatoes or beer at me when I croak." Given the fact that he wasn't in the best shape, Ferras delivered an impressive performance that was entirely on pitch giving the audience absolutely nothing to complain about. In fact, after enjoying his CD for the last few days, it was great to see him rock out on stage, which convinced me that he's not just another studio creation, but the real deal. Originally from Illinois, Ferras was signed to Capitol Records after an audition for the label's chairman Jason Flom while on Spring Break from Boston's Berklee College of Music. He teamed up with production outfit The Matrix (Avril Lavigne, Jason Mraz, Korn) and Gary Clark (Natalie Imbruglia, Lloyd Cole) to record "a really good pop record." The result is an accomplished debut filled with radio-friendly and heartfelt pop-rock tunes that give Ferras a firm shot at fame. Ferras' showcase last night included a gorgeous rendition of his ballad "Dear God," a moving performance of "Hollywood's Not America" and his misfit tune "Aliens & Rainbows" (a very personal song a"feeling different"). He closed his set with a song that is not on his album, titled "Phantom Song," which is another piano-driven tune that allowed the singer to show off his soulful voice. Special ArjanWrites.com correspondent Brian Burgess was one of the lucky few to attend a special Duffy showcase at the Maritime Hotel in New York City last night. 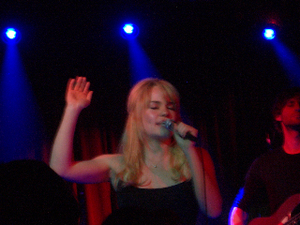 Following on the heels of her successful gigs at SXSW in Austin last week, Duffy took her refreshing brand of soul pop to an adoring crowd in the Big Apple. 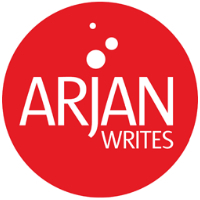 Read on for Brian's full report. Duffy, the Welsh singer-songwriter with the voice of a '60s soul diva, performed for an intimate crowd of 200 at the Maritime Hotel’s Hiro Ballroom in New York City on Monday evening. Before I get into a few details about the show, let me just note that there was some serious diva worship going on in the venue. Lots of industry people, but handfuls of adoring gays who kept getting in trouble for taking photos and videos. It was great! 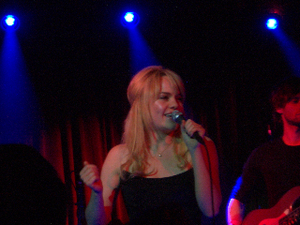 The smitten-with-New York Duffy showcased most of the material on her debut CD, "Rockferry," currently #1 for the second week on the U.K. albums chart. She opened her set with the album's title track that was followed by her bluesy next single, "Warwick Avenue." Standouts in the set were the defiant "Stepping Stone" (she confided with the audience, "I fell in love once, but never told him so I wrote this song") and "Syrup & Honey," an acoustic song that only featured the singer's vocals together with guitar work from John Greene that was totally brilliant. It beautifully exposed the intricate nuance of her soulful voice as well as her sweet, natural charm. She finished the song with a big, dimpled smile singing, "baby, baby, baby, spend your time on me." Then, a wink. I thought it was interesting to see how diverse her band was too. They looked like some were rock band members, others jazz, others R&B. Interesting reflection on her style, I think. 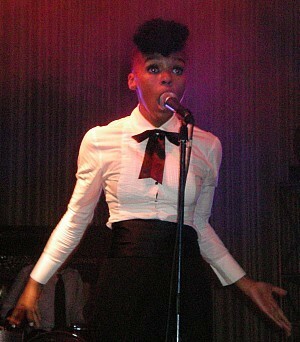 The show closed with her current #1 U.K. smash single four weeks running, "Mercy." After begging them for mercy, she left the impressed audience beggin’ for more, and she didn’t disappoint. She returned for one encore, "Distant Dreamer." Duffy is one to watch. Her talent only outshines her beauty. Look for Duffy’s debut album to release in the U.S. on May 13 on New Mercury Records. In the meantime, download her smash single, "Mercy," on iTunes, which you can also stream below. The Killers have a little secret that they don't often share, but on Friday night they spilled it. In a very rare showing, the group played "Leave The Bourbon On The Shelf" at an intimate surprise club gig in Athens, GA. The song is the first part of the Killers' "Hot Fuss" murder trilogy that also includes "Jenny Was A Friend Of Mine" and "Midnight Show." Musically, this unknown song is quite different than the other two with more emphasis on the electric guitar. 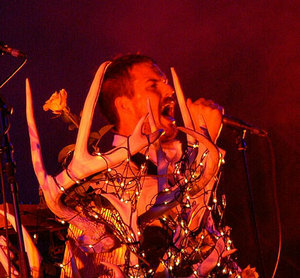 The three songs and "Bourbon" in particular have always been the topic of much speculation among Killers fans, and the group rarely comments on it, let alone performs all three songs in a row. But Friday night was a special night. Not only were the Vegas four excited to perform at Athens' famous 40 Watt Club (home of REM and The B-52's), the group also celebrated their last official North American show of their year-long "Sam's Town" tour that has taken them around the world. One of the things that struck me last night was what an accomplished showman Brandon Flowers has become. The insecure keyboard player had terrible stage fright when I first met him back in 2005. But he has now morphed into a full-fledged and confident frontman with his own unique and infectious bravado. The 500+ Athens crowd was a blend of a few tattooed rock 'n roll fans from Atlanta, teenage girls, lots of boozing University of Georgia frat dudes and the occasional gay. The set list featured both older and newers songs, including "Bones," "Read My Mind," "When You Were Young," "Smile Like You Mean It" and the crowd favorite "Mr Brightside." 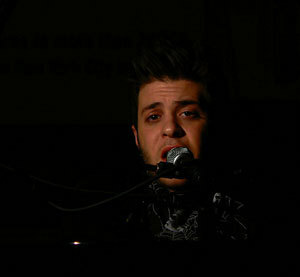 The group also performed their Joy Division cover "Shadowplay." Undisputed highlight of the show for me was a wrenching, acoustic rendition of their brand-new song "Tranquilize" that first hit British radio on Friday. See a video of it here. That song works extremely well as a live track with just Dave on guitar and Brandon performing the vocals with eyes closed purely focusing on the lyrics. It was pure rock 'n roll splendor.